Body: Two Foam pieces, 2mm, Tan/Flesh, glued. Thighs:Two Foam pieces, 2mm, Tan/Flesh, glued. Notes: Eric Paramore, a fishing guide out of Livingston, Montana, designed this hopper pattern in 2010 and introduced some improvements in 2012. Umpqua Feather Merchants picked up the pattern and the pattern has become quite popular within the Sierra. According to Eric, "This pattern has all the right qualities to be a real fish catcher. It has rubber legs, a foam bullet head and a very realistic silhouette. The legs of the hopper may seem a bit excessive, but I noticed last year that the trout, especially late in the season, liked this style of hopper with the over-sized legs, or Thunderthighs. 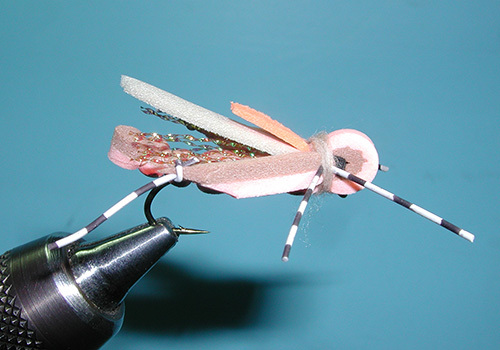 This realistic foam hopper pattern is easy to tie, and it can be tied in any color combination. As the summer went on, this hopper seemed to fish better and better. 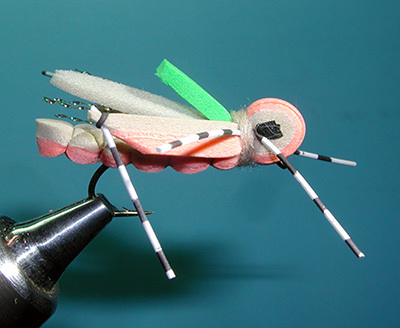 The realistic silhouette of this grasshopper pattern with its thick foam/rubber legs, bullet-head, large eyes and flashy wing seemed to trigger trout consistently throughout the summer, even in low, clear, late summer conditions. 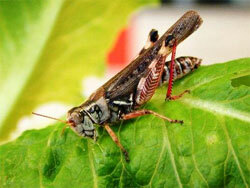 The realistic legs on this pattern set this terrestrial apart from most other hoppers. I also used this fly as part of a hopper/dropper setup with great results. The fly seemed to always land upright and supported heavy tungsten bead-head copper johns or pheasant-tails without a problem. 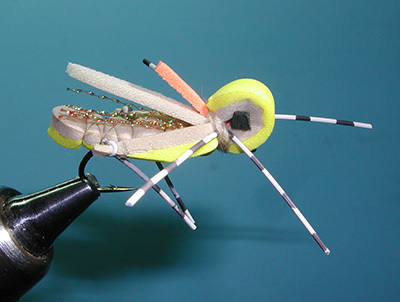 This fly also works great with a thick poly-wing substituted for the thin foam-wing. The poly-wing aids in floatation and visibility making this a must-have pattern when fishing from a drift boat." Body: Two Foam pieces, 2mm, Tan/Orange, glued.